One of the useful skills that several years of living abroad brought me is packing. I never need to think too hard about what to take because it’s become second nature, or because my suitcase is usually already packed and ready to go with everything I need except clothes. 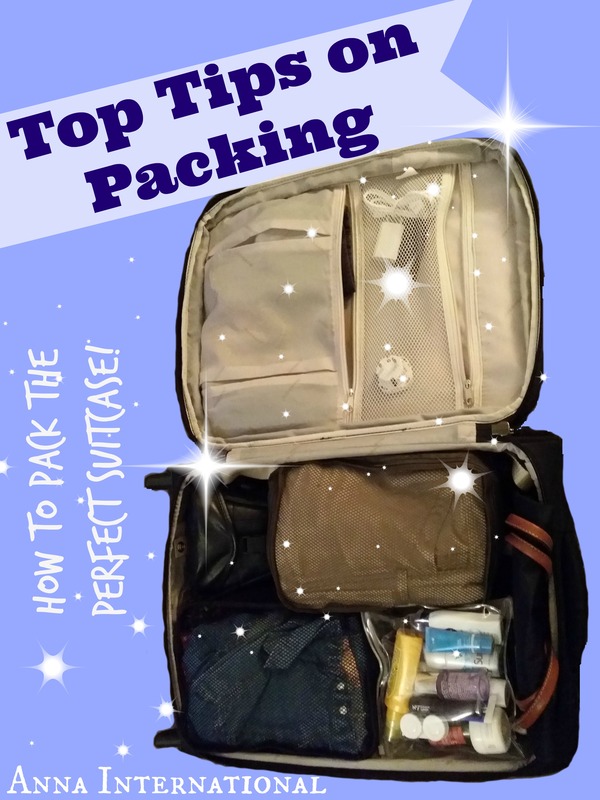 I know that lots of people struggle with this, especially when they’re only taking hand luggage (that’s a carry on for those of you reading in the States) and the airline has some pretty strict rules (Easyjet, Ryanair – I’m looking at you), so I thought a few tips might be helpful. Incidentally, what is not helpful is cats. Mine love a suitcase, secreting themselves in there under a guidebook the second my back is turned. This makes for slightly hairy clothes upon arrival, so is not to be recommended. First of all, make sure your case fits the dimensions allowed in the cabin by your airline. This seems to change constantly with each airline and as between them, so check your boarding card or their website. A rigid one with wheels and a collapsing handle is always easiest to manoeuvre and has the most space. Bag chosen, remember that you can often only take that one bag (though Ryanair now allow a second small handbag free (finally a step in the right direction), so make sure your handbag will fit inside it. My holiday handbag is always a Longchamp Le Pliage, because it folds away to nothing when you’re not using it so can easily squish in the top. They’re pretty expensive, but they last forever, or you can pick a lookalike one up for about a fiver on market stalls everywhere! It is also big enough to be a beach bag if you need it, which is great. So, to actually packing. First off make a list. It really helps because you will know you’ve not forgotten anything and it will make sure you don’t wake up on the first morning of your holiday realising you’ve got no clean knickers! (This happened to a friend of mine, and meant the first morning of our holiday was spent searching for H&M to buy her some new ones). Make the list on your computer, and then you can print it out and use it every time you go away. I always lay everything I’m taking out on the bed before actually packing the case. There will be some things which are easy to chuck in – phone charger, plug adaptors, make up and wash stuff, and you might find that you don’t use some of these between holidays, so you can just leave them in your suitcase to save you time next time. When living in Italy and travelling frequently I actually had a separate phone and camera charger which lived in my bag to avoid ever forgetting them, and a wash kit with its own toothbrush. If you travel a lot this really helps. I also keep my passport, travel insurance documents and passport photocopy in there to avoid last minute rummaging around in drawers while the taxi is tooting outside. It all gets a bit more complicated when it comes to clothes. What season is it? Do you need swimwear? A coat? Winter boots? You can’t make the perfect list of items which will suit every trip, but the best tip I have is to mix and match everything if you’re just going for a few days. Make sure that whatever trousers you are taking go with each top or jacket, make sure you can wear the same shoes with most outfits (and have comfy ones for walking during the day, but also some more dressy ones if you’re going out at night). Lay it all out on the bed so you can visually check that your outfits all complement each other, and it will feel like you have a much bigger wardrobe with fewer clothes. Once you’ve laid it all out on the bed, I always then take away a few items, because the instinct is always to pack too much ‘just in case’ and you hardly ever end up wearing everything. There’s always the option of washing things, or having them laundered if you’re staying in a posh hotel, so it will not be the end of the world if you don’t take two entire outfits for every day of the trip. 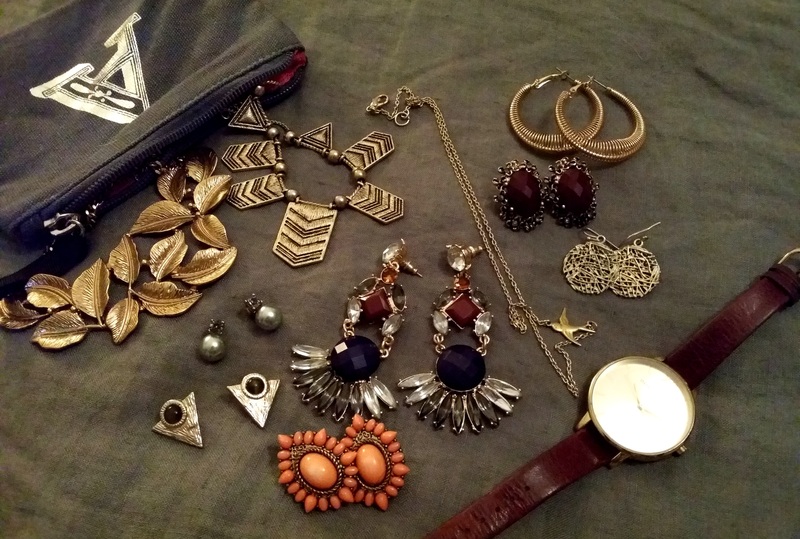 The same goes for accessories – make sure your earrings, necklaces and watch work well with each outfit, and you should have several combinations with just a few items. I hate the airline liquid restrictions which to me seem to make little sense, but I imagine they’re around to stay, so I’ve got quite used to thinking in 100ml or less. 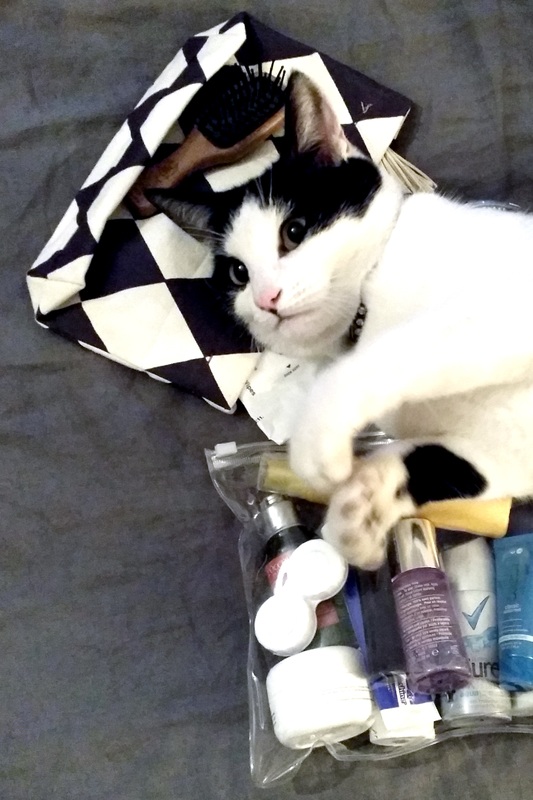 You can now buy miniatures of lots of toiletries for this specific reason, and these are great for holidays, as are samples that you get in magazines or beauty boxes. I always keep these for just this reason. A tiny 10ml mascara might seem useless as a free gift, but when the space it saves means you can take your favourite perfume, you might change your mind. 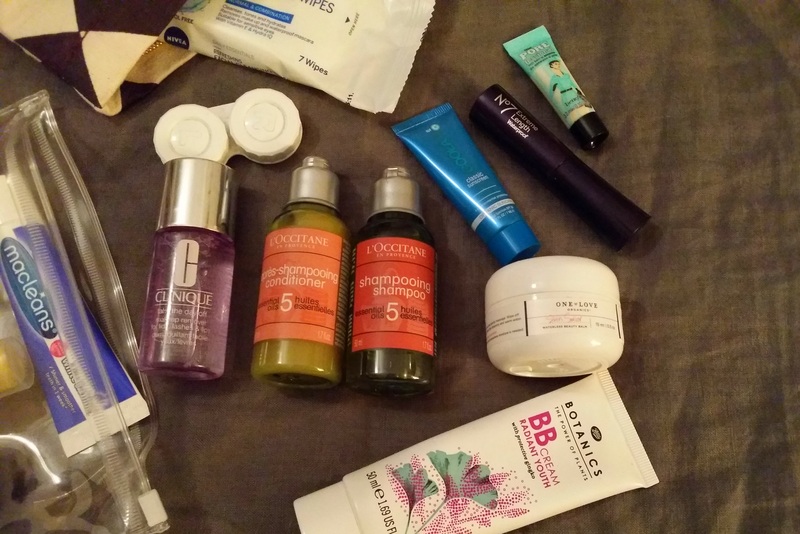 I have a little stash of these items which I keep to dig into for flights or weekends away when you’re only going to be one night. That free sachet of shampoo can suddenly come into its own. I also like to buy my favourite perfume in the smallest possible bottle, so it can come with me on holiday, and buy mini suncreams too, because with my pale skin I can’t be without it where there’s going to be even a hint of sun. Multi-purpose products are also great – something that can be used as blusher and lipcolour will save on space and liquid allowance. A good tip for extra space in your luggage is to wear your biggest items. This is rarely hard for me, as I leave the freezing or rainy UK, very happy to wear boots and a coat to the airport. Sometimes it has been necessary to take these items even if I won’t need them whilst away just so as not to get hypothermia on my way there. You may be lucky enough to live somewhere warm and be flying somewhere warm, so there’s no need for this kind of nonsense (though you could always wear your sunhat). Next, start with your shoes on the bottom of the case. If you can, roll up underwear and stuff shoes or boots with it. Then put anything heavy in at what will be the bottom of the case when upright. I tend to put my camera bag here, padded with some softer items. Then put any small items such as chargers and whatnot in the side pockets so they are easy to find. Now, how you pack your clothes depends on a few things. If they are delicate fabrics you may need to carefully roll them and line them with tissue to avoid creasing. I do not own any such clothes as I cannot be bothered with that malarkey. 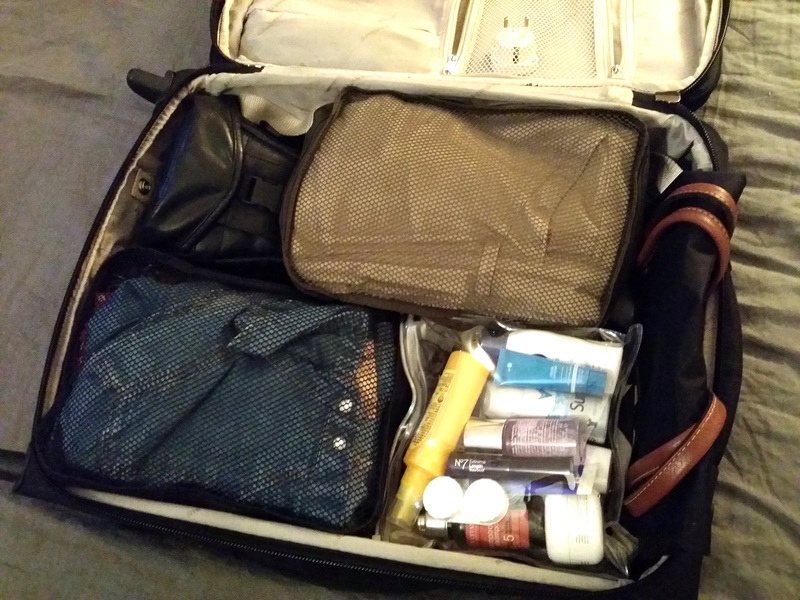 I always roll clothes because it is more efficient, and then pack them neatly into a couple of packing cubes, which keep your case tidy, make everything easy to find, and if you have to open it up for inspection at security means you can happily do so without worrying about your bra flying out. Around these cubes you can pack your washbag, any books or travel guides, and anything which will go into your handbag when you arrive at the other end so it’s easily accessible. 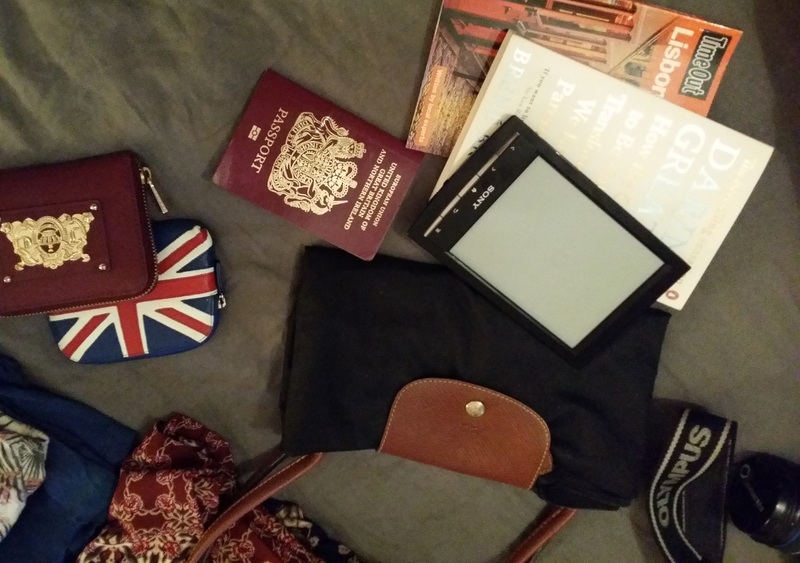 Passport, purse, phone and tickets always go into a small pocket on the front of my bag, but always be sure to keep an eye on your bag if you’re going to put your valuables in such an easy to access spot. Most of the budget European airlines have weight restrictions as well as size. Once you’ve packed everything, pop your bag on the bathroom scales (or if you travel a lot, invest in a hand held bag scale, they are so much easier than balancing a suitcase on something half its size!) and check that you comply with them. There’s nothing worse than arriving and finding that you have to spend half your holiday money on excess baggage fees. So, that’s it. Now you know how to pack like a pro, prepping for your next trip should be a piece of cake. Bon voyage! P.S. Apologies for photos, taken at midnight before a 3am flight! Not my finest work.